On first impressions: I traveled from California to Guatemala when I was 25 to study Spanish. I met my husband, who is from Antigua, on that first trip and moved here permanently in 2010. The thing that surprised me most at first was the rain. I arrived at the beginning of the rainy season, which goes from May to October. Many of the first Spanish words I learned were the different ways Guatemalans talk about rain: chipi chipi is barely drizzling, lloviznando is raining softly, aguaceros is a downpour, and chorros de agua is raining cats and dogs. When my daughter, Elena, was little, I bought her rain boots so she could jump in puddles, and my neighbors were shocked. Getting wet for us was fun — we would go home and throw her clothes in the dryer — and I didn’t realize at first what an incredible privilege that was. 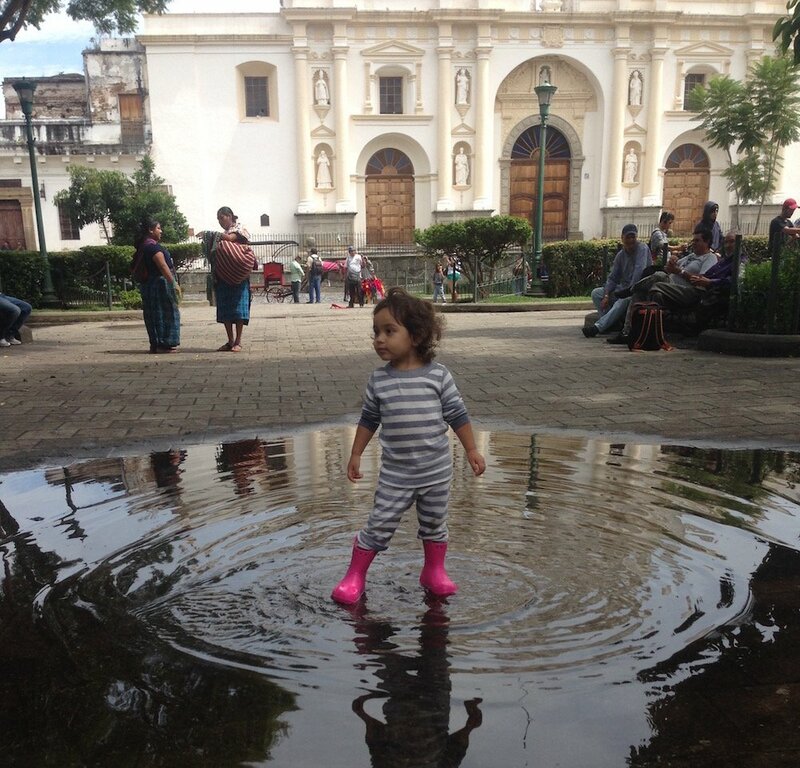 Many Guatemalan kids don’t have extra clothes or dryers at home, and getting wet equals getting sick. 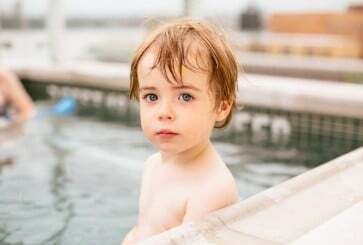 Many parents do everything possible to avoid their kids getting wet. On life in Antigua: Antigua sits in a valley surrounded by three volcanoes (one is still active!). The town is a lovely blend of old and new. It’s not uncommon to see a farmer walking home with his horse piled high with corn husks to make tamales, or a woman carrying a stack of firewood on her head, while cars drive by and teenagers sit in the park snapping selfies. We have magnificent 500-year-old buildings and cobblestone streets, but also colorful painted walls, bright flowers and vibrant textiles. On running errands: One thing I love about Antigua is that it’s so walkable. The coffee farmer, Freddy, lives on the road we take to preschool, so on the way home we often stop to get beans. A few times a week, we walk to the plaza by our house and get freshly squeezed orange juice from a woman named Marta. I appreciate being able to buy our bread from the local bakery and our lettuce from the local organic farm. I love that my daughter knows where everything comes from. We speak English at home, but when we’re running errands, we speak Spanish. I’ll give my daughter some money and she’ll order the bread or tortillas or fresa ice cream. On not buying in bulk: After my maternity leave, when I needed to restock my office, I went to the little store and pointed at a box of paper clips. The lady behind the counter asked me how many, and I said a box: una caja. She then proceeded to count each individual paperclip. I bought 98 paperclips that day and learned that paperclips, pens, sheets of paper, Band-Aids and even diapers are sold individually in the small stores in our town. Most Guatemalan families we know buy only what they need in the moment. On privacy and safety: Theft is very common here, so, for example, if a restaurant has tables and chairs outside, they’ll be chained down even when in use and then brought inside when the restaurant closes. When my husband first visited California, he thought it was really odd that people would leave their cars, bikes and lawn chairs outside. We live in a gated community here, along with both Guatemalans and expats. There’s a large metal gate at the entrance and high walls in front of the buildings so you can’t see in. 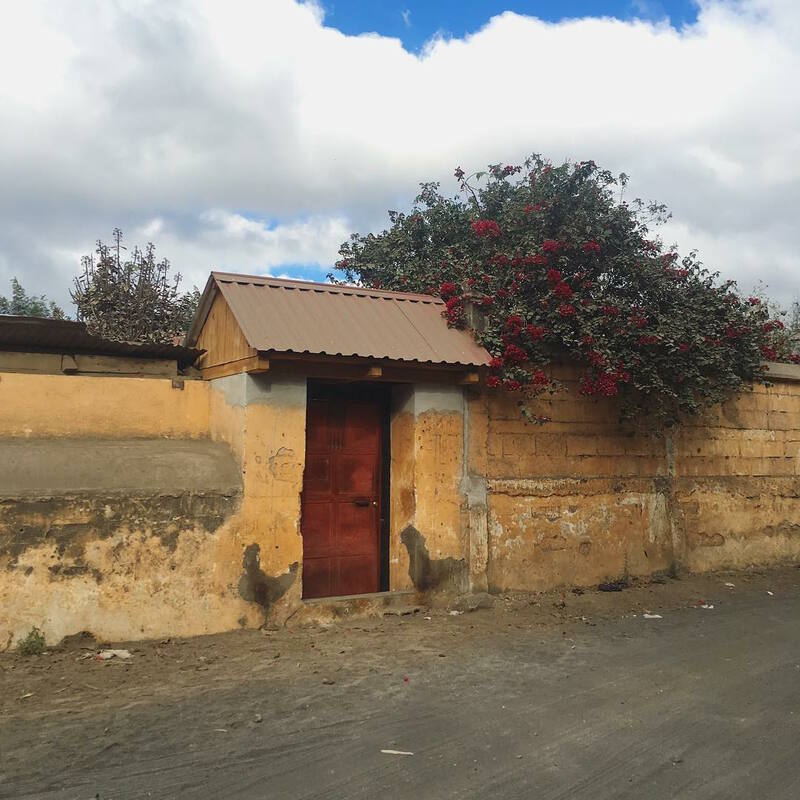 Even outside the gated communities almost every house has a wall around it, whether it’s made of cornstalks, corrugated metal or cement. Protecting one’s property is paramount. On childbirth: In the past, Guatemalan women traditionally had home births with midwives. Although nowadays more women choose to deliver at hospitals, two out of every five births in Guatemala are home births. Due to lack of space in national and public hospitals, no one can go into the labor and delivery room with you, not even your husband or partner. For that reason, I had both my kids in water-filled tubs at a birthing center in Guatemala City with a German-Guatemalan midwife. My husband was the first man from his family who got to be with his wife in labor and delivery, and he cut the umbilical cord! He says he wishes more Guatemalan men could witness their kids’ births. For my son, we also invited my mother-in-law into the birthing room. Since her other grandkids were born at the national hospital, she never got to be there. It was really special. On carrying babies: Most Guatemalans carry their babies with a sheet or blanket known as a cargador. When I was pregnant with Elena, my mother-in-law gave me a beautiful woven one. She showed me how to tie a knot at my shoulder and pull the fabric around the baby’s feet, but it felt awkward and bulky. I was pretty sure I wouldn’t use it. Of course, I was very wrong. Now, more than four years later, my daughter still sleeps with her cargador every night. My mother-in-law gave me another one for my son, and this time I was immensely grateful. On nursing: My Guatemalan relatives are very concerned about children being cold. Even when it’s 70 degrees out, babies are wrapped in blankets and wear hats and socks. They’re also very worried about pregnant and nursing mothers getting cold. 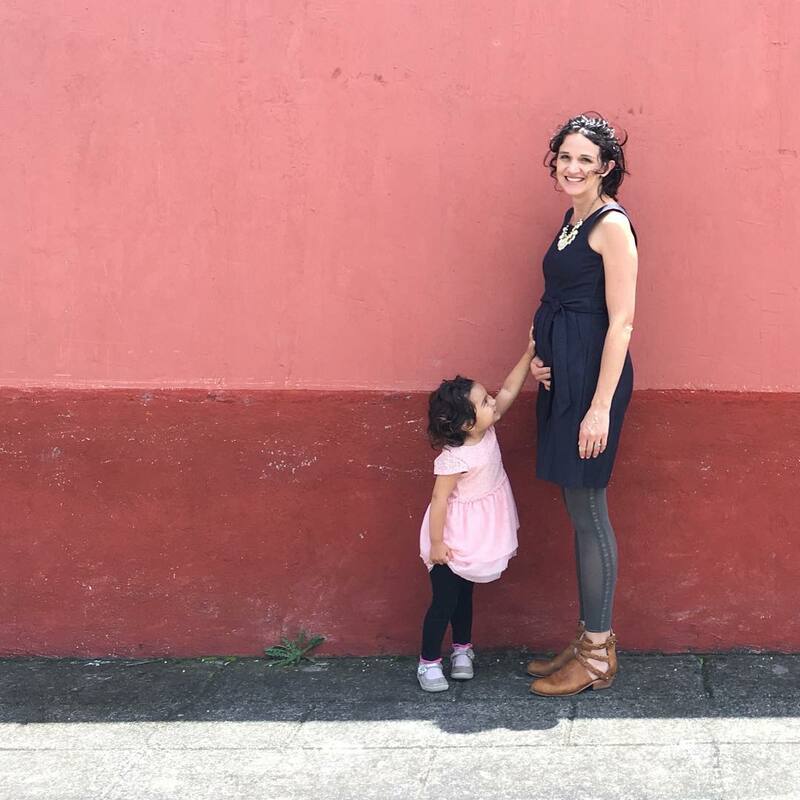 I was told by many Guatemalan women — my sister-in-law, women on the street, waitresses — that I shouldn’t drink anything cold while I was nursing. My mother-in-law was concerned that I wore only a nursing tank because she said my shoulders were exposed and my milk would get cold. Once, a friend ordered a smoothie at a café. The waitress walked over and kindly said, ‘I saw that you were nursing so I warmed it for you.’ A strawberry and banana smoothie, heated! On swaddles: My mother-in-law is very respectful and lets us do what we want, but she sometimes tells me later if she didn’t agree with something. When Elena was an infant, I got an American swaddle — the one that looks like a baby straight-jacket — and put her in her crib. 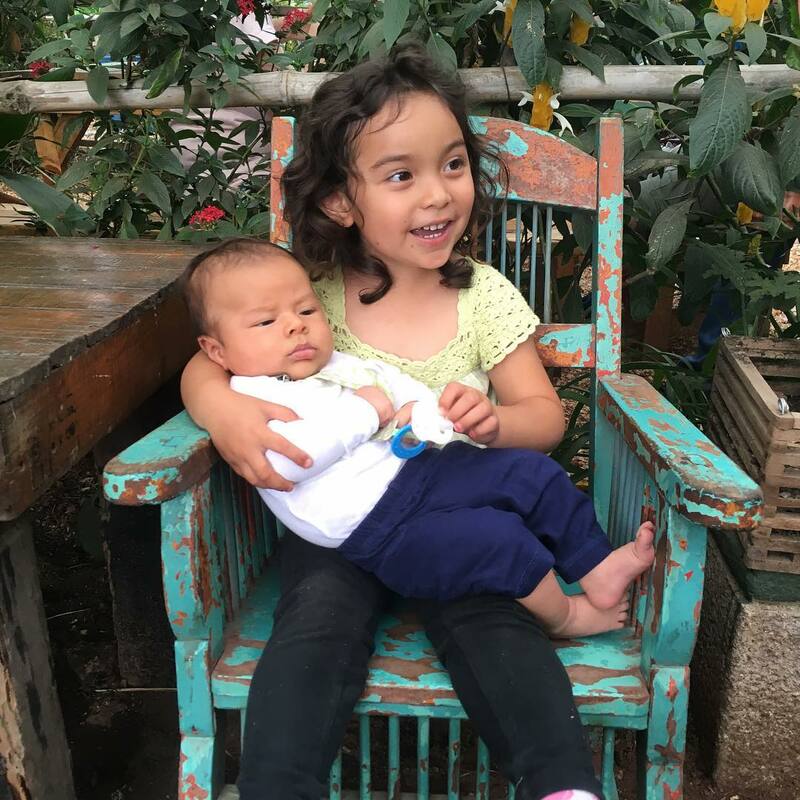 Years later, my mother-in-law said, ‘I went home and cried thinking of Elena stuck in one of those things all by herself.’ Most Guatemalan homes don’t have separate nurseries; babies sleep in a bassinet or with their parents in bed. Co-sleeping is not a trend, it’s just what you do. On the importance of beans: Every week, I make a big pot of beans to eat with our meals. I boil dried black beans with water and salt for three hours, then add a touch of onion powder at the end. Many kids eat beans with bread as a sandwich — my daughter will take a bean sandwich over peanut butter and jelly any day. As soon as she could pinch with her fingers, I would put black beans on her high chair. Her first phrase was actually ‘Mas beans!‘ I have grown accustomed to having black beans with breakfast, but still am not a huge fan of beans on bread. I once bought what I thought was a chocolate croissant — imagine my surprise when I took a bite and tasted black beans! On family gatherings: We live about 20 minutes from my husband’s family and see them weekly. My husband’s siblings are all married with kids, so the 20 of us will gather for lunch, which is the biggest meal of the day. It’s always loud and full of jokes. The little cousins run around together — sometimes I try to listen in to hear my daughter rattling off games in Spanish! On birthdays, my mother-in-law will make pepián, my favorite meal (and what many people think of as Guatemalan’s national dish). 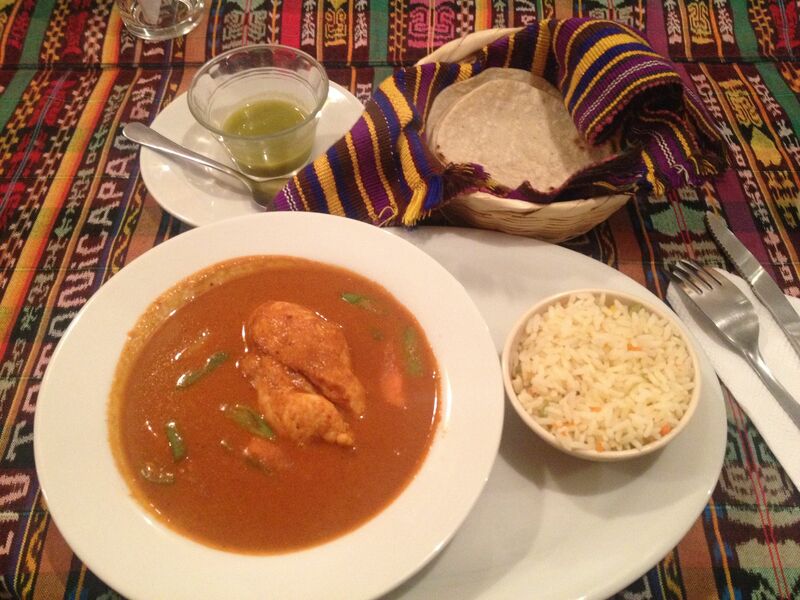 Her recipe for the brown stew has roasted pumpkin, sesame seeds, tomato, onion, cilantro and chicken, served over rice. Elena loves it, and I’m sure my son will, too. 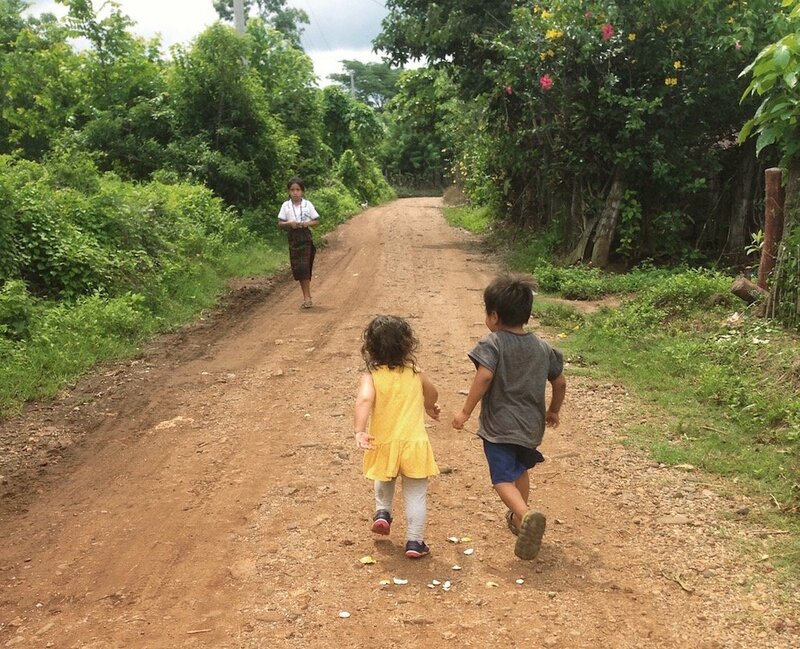 On kids drinking coffee: When Elena was two, we visited one of the rural communities where we work. One evening, at a family’s home, the mother boiled coffee over an open fire, added sugar and served the sweet, watery coffee to each of us. She poured a small cup for her young daughter and she handed a cup to Elena. The little girl sipped her coffee across the table, but I asked my husband to drink our daughter’s. It wasn’t until later that I realized that they didn’t have a faucet with clean water, so they boil water and give kids sweet coffee so they don’t get sick. After that night, I learned to observe and understand the complexity of a situation before assuming that my cultural knowledge is best. 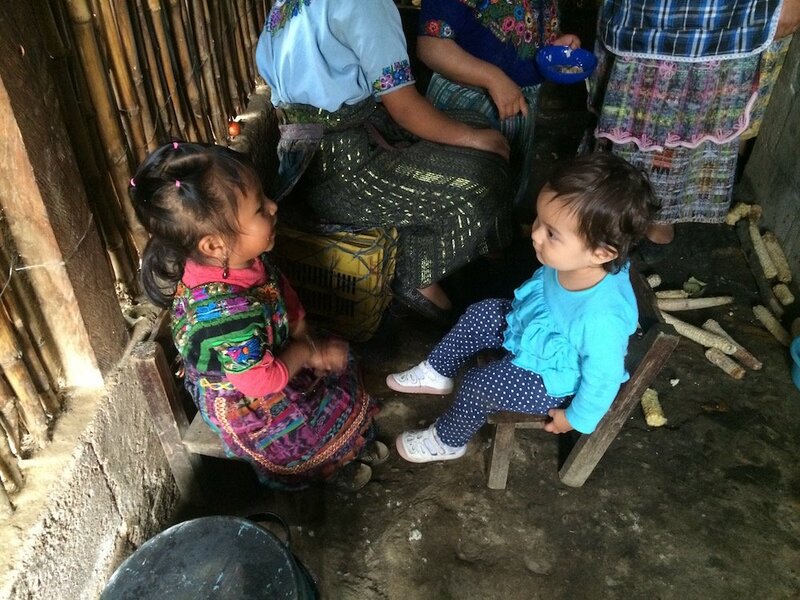 On greetings: Greetings are very important in Guatemalan culture. If you pass a friend or stranger on the street, you’ll say ‘buenos dias‘ in the morning, ‘buenas tardes‘ in the afternoon, and ‘buenas noches‘ at night — or just ‘buenas‘ for short. It’s a way to be polite and say ‘I see you.’ These greetings have been hard for Elena since she’s so shy. We gave her a sticker chart to reward her for every time she does one. And goodbyes are equally as important. When I started out as a teacher, I’d say a collective goodbye to whomever was in the room; and if I didn’t see anyone, I’d just clean up my stuff and walk out. I soon realized that nobody does this — you’re supposed to say goodbye to everyone individually. Even at a staff meeting, if someone has to leave early, they stand up and do a quick goodbye to everyone in the middle of the meeting! On the school system: Elena attends a wonderful preschool, but I’ve scratched my head about their emphasis on things like developing good penmanship very early on, with less of a focus on creativity. She’ll often tell me, ‘My teacher said we need to stay in the lines when we color.’ I tell her that at school she should follow her teacher’s directions, but at home we can be creative or silly or color outside the lines. 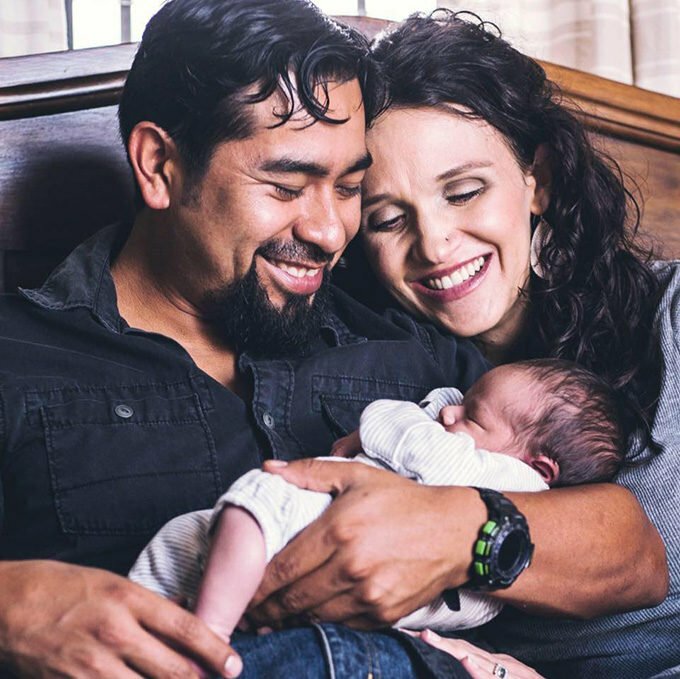 The phrase ‘In our family, we…’ has been a way for my husband and me to help define what we may do differently than the traditional Guatemalan culture without criticizing or wanting to change it. 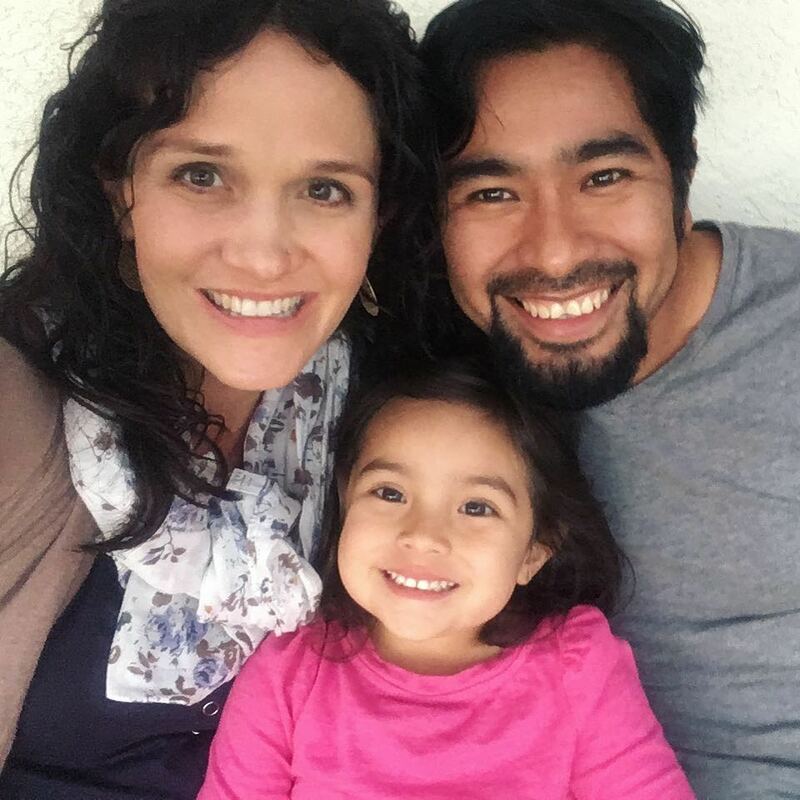 On feeling at home: A few weeks ago, we were in the car and my daughter announced, ‘Mama, I’m chapin [slang for Guatemalan], and Mateo is chapin and Daddy is chapin.’ Then I asked her, ‘What am I?’ She said, ‘You’re Californian.’ Of course, I do see myself as a foreigner — an American who has chosen to call Guatemala home — yet I became a wife and a mother in Guatemala, so it’s certainly shaping how I raise my children and live my life. Perhaps one of the oddest feelings is when I realized that what still feels foreign to me is completely familiar to my kids. Last year on Guatemala’s independence day, I watched my daughter put her hand over her heart and hum the Guatemalan national anthem as the flag was raised. Guatemala is the only home she’s ever known. And we love it here. P.S. Our full Motherhood Around the World series, including Iceland, Turkey and Japan. wow, I really enjoyed reading this article, I’m from Guatemala but I live in USA, and I missed so much everything, and I’ve always believed that childhood in Guatemala, even if it’s simpler, is freer,. 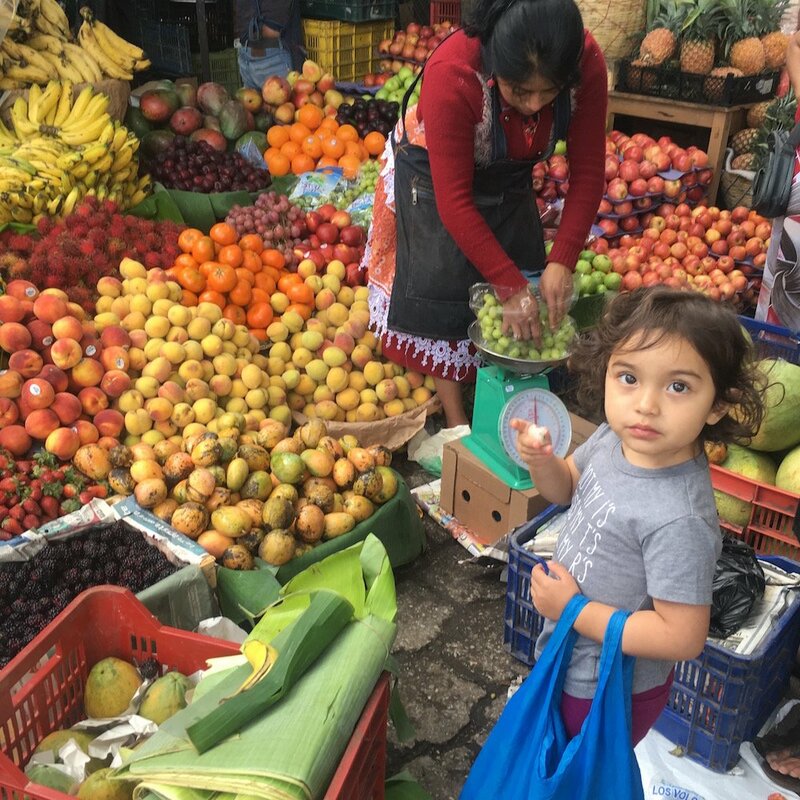 Thank you for sharing your beautiful pictures, and experience and it’s true my daughters always want cafe con champurradas =0), Dios bendiga tu familia..
Reading this blog makes me miss Guatemala even more. I am an adopted from Guatemala, I met my husband in Guatemala back in 2003, when I was there learning Spanish. I lived in Guatemala off and on for two years back in 2007. In 2009 we moved to the U.S., where I am from. It has been almost 10 years since my husband has seen his family and our children have been with their relatives. When we lived in Sumpango, my daughter was 2 and my son was a new born, now they are 12 and 10. Hi Sarah, thanks for sharing a little more about your story. Guatemala is part of your heart & life — and I hope you and family get to come back soon!! Hi there, being married to a chapin definitely brings some shared experiences- for sure! ;) And in my opinion, bringing kids anywhere has some challenges, but Guatemala is really great place! Don’t hesitate to reach out. I love this post. Thank you, Michelle, for sharing your experiences, As someone is developing friendships with and working alongside Guatemalans , I find this so interesting and helpful. I will actually be in Antigua on Monday. Can’t wait to be back in that beautiful country among its delightful people! I really related to this story as I have been married twice. The first to a Chapín and the second, also a Chapín. The second is a TOTAL KEEPER and my best friend. My first trip to Guate. was when I was 18 and I fell in love with the country, my new family, the colors, the beautiful humbleness of the people and the traditions. (I am American from Alaska with red hair and extremely pale skin) My relatives live in the city but Antigua is my favorite town! I’ve lost count how many times I’ve been to Guate. because we go about every other year for about a month at a time. I do know, however, that I went to Antigua every single trip ~ in fact last Christmas we went 3 times for whole day trips. I HAVE to have my dulces típicos de Doña Maria Gordillo! My husband (current) and I have dreams of retiring in Antigua also. The history and architecture alone are worth braving the afternoon traffic “colas”. (Meaning tails and slang for long traffic lines that often come to a stand still) I even love the traffic! When I had my first child, my family living in the modern city, were so totally floored when I started nursing my 9 month old son. What was an American doing feeding her kid in such a traditional way!?!? We already were co-sleeping and I guess it was strange that we would raise our kid in such a traditional way – though to me it just seemed the right thing for me to do not realizing at the time that most city kids were bottle fed. My second was an adoption hhalf Caucasian, half Yupik native Alaskans and I wasn’t able to breastfeed him. When we are in Guate. my boys know they are home – they both speak Spanish and the family speaks no English. They become 100% Guatemaltecos when we get off the plane….. that means greeting everyone hello and goodbye, being extra respectful, doing whatever their cousins do and eating what is on the table. My kids grew up on beans and tortillas and the fav was refried black beans on bread – it’s just what you do, you know? The food traditions are the easiest to honor in the states and I feel it’s important. The thing about getting wet is SO TRUE to the point of almost having a heart attack when I let my Alaskan American Guatemalan kids play in the rain in shorts and shoes. It has taken them a long time to understand that cold for them is hot for us. The best thing is that all that advice and worry comes totally from love. Before I moved to Alaska 35 years ago I lived in the south and so I had already experienced some of the older beliefs. Maybe that’s why it feels like home? My kids know now what makes Abuelita worry and out of respect they, now that they are older, try to refrain from freaking her out too much. I adore my Guatemalan family. They are beyond special. They would give anyone the shirt off their backs if they thought it would help them. The house in Guate is in a gated community and I let my now adolescent son ride bikes and do whatever everyone else does with his cousins. The only bad part is the flight home. That time is often filled with tears and planning our next trip. Program luckily here but there are few people from Guate. here in town. It feels good to hear everyone’s comments and to know that there are others that love the place that is most special to us and for many of the same reasons. 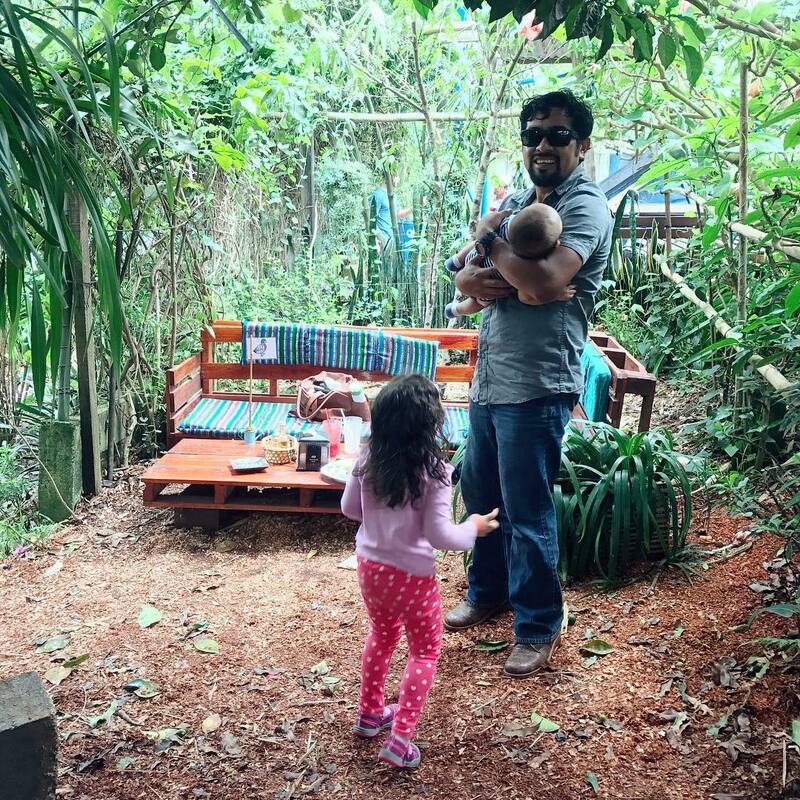 I love learning about other cultures in general but parenting styles give you a more personal, intimate window to other parts of the world and learning the similarities makes this planet seem not so big and the people on it more connected….. Your article brings wonderful memories of my childhood in Guatemala in the late 1960s. I too was raised on warm milk, tortillas, black beans, aguas frescas, café con leche, playing in puddles and surrounded by the kindness and humbleness we Guatemalans are so known for having. As a child I remember my grandmother taking me every morning to el Mercado and buying all the goods needed for the lunch of the day. My son (a pizza pie with two toppings) was born and raised in Boston the same way I have been raised as a child. To this day his favorite dish is black beans and tortillas . He is very proud of his Guatemalan/Irish heritage. Thanks for sharing these wonderful, colorful pictures. Thank you for sharing your experiences. I am married to a Salvadorean and we have raised our kids in England and Germany. I feel that the ‘in our family…’ is a mix of all of these different cultural expectations having had to be negotiated over time. Unfortunately we haven’t been able to live in C A closer to family there. But the Latino element is getting stronger with my daughter in law being Salvadorean, too! I am Guatemalan, and though I did not grow up in Guatemala, this one really resounded with me. My parents migrated to the US when my mom was pregnant with me, and all of these customs she’s talking about are things I still grew up with, or saw in my family when we visited every summer. Black beans were mine and all of my siblings very first food, a tradition I plan to maintain with my own children. Thank you for sharing such a lovely story! They are such a cute family! I like that they both seem very calm about navigating the cultural differences. Even with in laws. My husband is from a very different culture, and thats definitely something I struggle with! I’ve read all of these but this is my favorite! What a beautiful, colorful country! Thank you for the insight! Aww, why thank you Mea! Oh I love this series so much. This installment in particular made me tear up over and over. The bit about being the first dad in his family to witness a child’s birth, oh my gosh. And the grandma being invited to birth as well. Just so much love coming through in this post, words and pictures. And I love the respect “in our family we..” Full on tears at this. We too raised our children with this motto, as vegetarians in a cattle country state (& family), as home schooling progressives in a community of fundamentalists, our children learned to be proud of our family’s values, but never see them as above someone else’s. I only wish my husband and I had adopted the “how is this working for you?” That is brilliant. Thank you CoJ, excellent post and comments too! It’s funny how no matter where you live the Latino culture is strong! My husband was born and raised in Mexico till about the age of 9 and I was born here so I am a California Mexican ;) or a bit of a coconut like he would say. Even though his family has been living in the US for 30 years he’s still parenting much different than what they’re used to. We both put in equal effort in our parenting. I am so glad my daughter is getting to see her 1st male role model do it all as well as I do & vise versa! Yes, I agree. Culture is so strongly ingrained in us from such a young age. Sounds like you and your husband are doing such a good job raising your daughter! Beautiful post! So much of what you said is true of any marriage and family. Loved it! Loved this one! Such a lovely family. This series is so beautiful, I adore and appreciate every one. Thank you! I loved reading this, thank you! I have several friends in the US (Minnesota) married to Latino men (Peru, mostly) who came here as young men. Noticing the cultural differences has been so interesting, and I love learning about this perspective of an American woman in Latin America. Yes, thanks Lisa. Yeah I have also learned a lot from other friends who married interculturally. It is always so interesting to learn about summaries and differences across countries and cultures! Yeah thanks Lisa. It’s always so interesting to learn about similarities and differences across cultures and countries! This is such a lovely read. What an eye opener. These are my favorites – even that I don’t have kids. I am german and was traveling a lot in the past so I’ve been to most countries you are publishing interviews about. Anyway I always learn something new and inspiring. Beautiful! Simply beautiful. As a new mother raising her baby outside the USA, I picked up some pointers. Best wishes! Thanks Laura! Yes there are some commonalities I think for anyone raising a child outside of their home country. 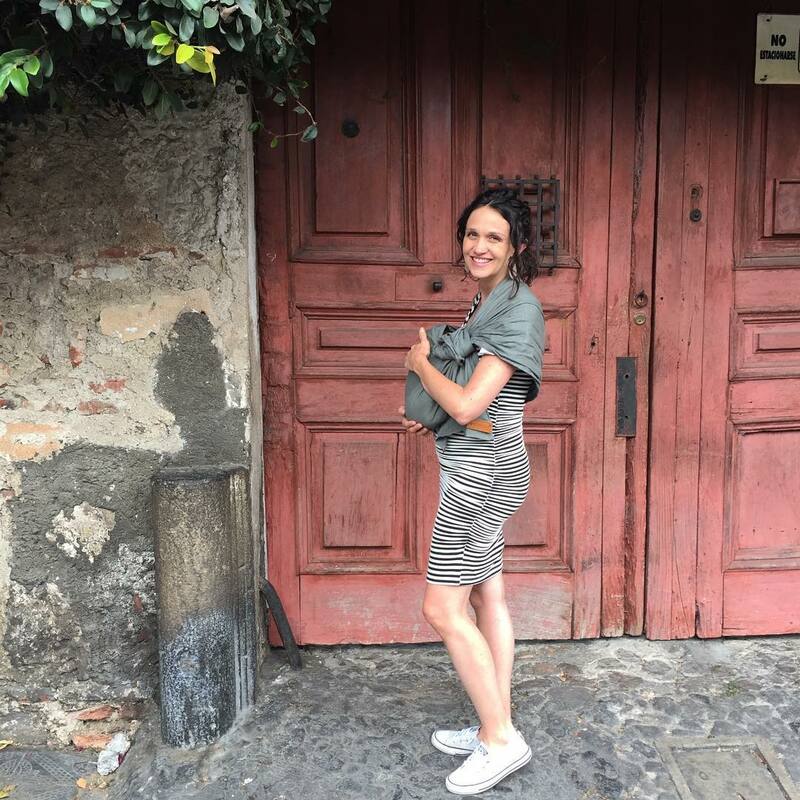 I loved carrying my daughter in a baby carrier while walking around Antigua. She wore these little velcro wrap sunglasses that sent passers-by into fits of giggles. After trips from La Bodegona, she would fall asleep in the tuk-tuk going over the cobblestone streets. We always had socks on her feet and kept a little blanket with us even if it was warm, because people on the street worried (and would definitely say something) if they thought a baby could be cold. Oh I love these memories that you shared! We know the Bodegona and those tuk-tuk rides well ;) What a small Antigua world! Beautiful. Having lived in Xela over the course of several years and now raising a family in Arizona, this story warmed my heart. I have great respect for Michelle and her family. Felicitaciones! Oh thank you. I spent a summer in Xela learning Spanish on my first trip down here! Such a beautiful city of Guatemala! Oh, my gosh. Just so lovely – all of it. Thank you for sharing. Congrats Cup of Jo! This kind of articles help us know other perspectives. I am from Guatemala and reading about my culture through the writer’s eyes is very interesting. Thank you. Your words mean a lot. I have loved living here and learning about your culture! This makes my heart happy. I am half Chapin. My husband and I got married in Antigua two years ago. We were thrilled to share such beauty with so many of our friends who might not have traveled there otherwise. My mother is from Guatemala but I was born and raised in the states. I was raised in the south and much of my adolescents was trying to navigate life with a mother from a different country and with very different cultural traditions. I remember a time when I just wished I looked like my friends and my family did “normal American” things, like eating hot dogs with buns instead of tortillas (called shucos)! Luckily I wised up and am grateful that I look different and had the mixed cultural upbringing. The part about the rainy season makes me laugh – I thought some of these sayings was just my mom making stuff up! Michelle is like so many ex-pats who go there. They visit, fall in love and get involved working and giving there time to help the beautiful people there. Thank you for highlighting this special place! Reading made me super excited as we are planning a trip to my parents home in Antigua this winter with our baby (who’s due in October) to proudly show her her roots! Oh hello, Michelle. We were also married in Antigua. Such a magical place for a wedding. 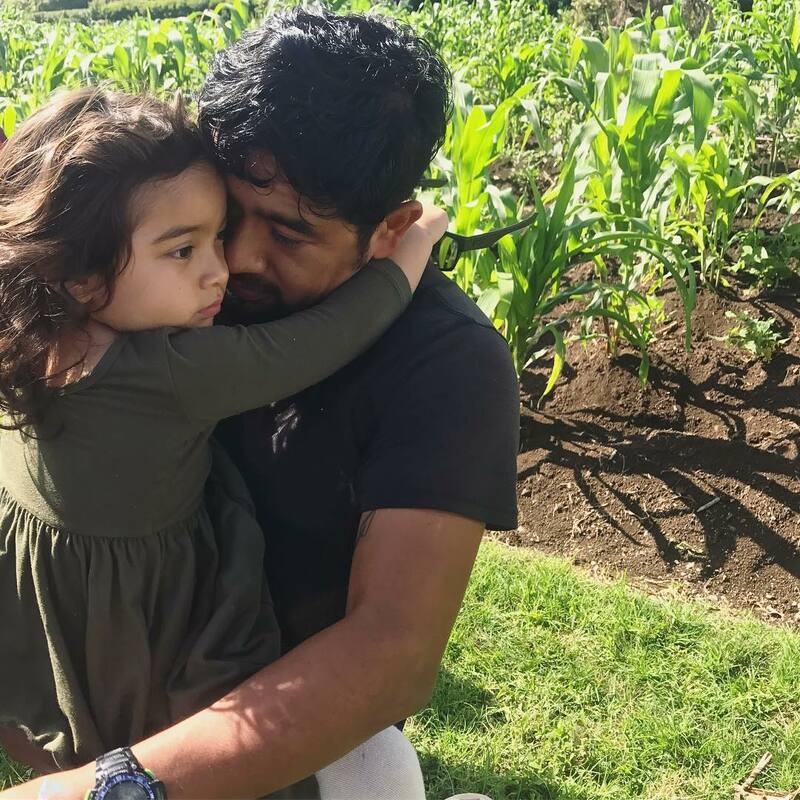 I love the stories you shared- I often wonder how my daughter will feel growing up in Guatemala…if she’ll one day feel “American.” I wonder how will she connect that part of her cultural history? Congrats on your upcoming baby! Enjoy living in Guatemala, you got such a good family. May God bless you all. This is the first I’ve heard of swaddling infants being an American thing. I assumed it was widely used globally??? I’ve seen varied depictions such as a Mongolian baby swaddled in the documentary “Babies”, etc. Would love to hear more from other commenters, I’m intrigued! In Sweden (where I’m from) The advice is to avoid swaddling at all as this increases the risk of SIDS. It is known that swaddling does calm babies etc but research shows that the baby should have free mobility etc to minimize SIDS-risk. Yeah you may be right. I don’t think its an “American” thing per se but it is definitely the norm or expectation of what you do with babies from what I remember growing up. Loved, loved, loved her thoughtful approach to parenting and adapting to a place that she’s unfamiliar with. And I loved the part about his “inner” world and learning to be a father in a way that’s unfamiliar to him. It is still like this in my Country. You cannot trust the water so even kids are given watered-down and sweet coffee/tea. Luckily my Mother sent home a water filter to be used & that’s what we drank from on our recent trip back. Luna, yeah I think that is true in many countries around the world. Where did you grow up? Love this! Lovely thoughts about cultural exchange, making assumptions based on our own cultural bias, and communication in marriage. 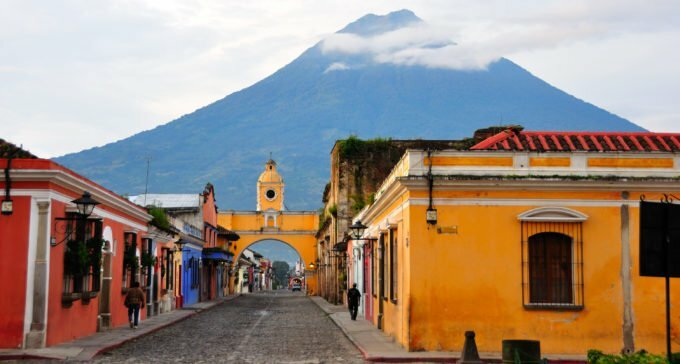 I was lucky enough to study abroad in Guatemala City in college, and I took the bus to Antigua every couple of weeks. 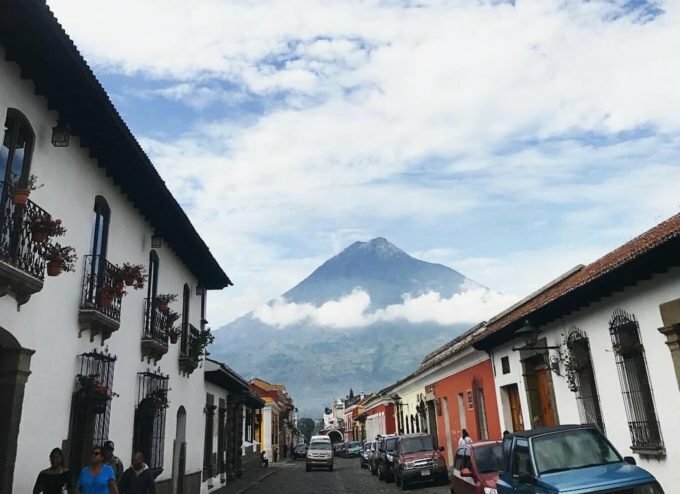 Guatemala is the MOST beautiful country, I loved the warm culture, the people I met and lived with, the yummy food… I actually really loved bean sandwiches! That trip was over 10 years ago and I’m getting emotional now remembering how much I loved it! Thanks for sharing. Gos bless your family and enjoy Guatemala!!! The coffee story made me laugh – I’m born and raised in the US with parents who were also born and raised in the US, but I’ve been drinking coffee as long as I can remember. My parents were quite strict about many other things, but they always let my brother and me drink coffee if we wanted :) That must have been a very humbling experience for Michelle, and I’m so glad she shared it. Also, the “is this working for you?” question is so, so good (cultural differences or not). Lovely advice! Ha. Love this Shannon. I drink enough coffee now to make up for the fact that I didn’t drink it as a child. This has been my favorite post of this series. I love the healthy and simple reminder of “is this working for you?” to share with my spouse. I think some of our tiffs could’ve been avoided if this check-in was used regularly. While we choose to live in the US right now, we too are a multi-cultured family learning how to live our life in ways differently than we were raised. And proud of it. Love and light to you and your family! Thanks Marissa! 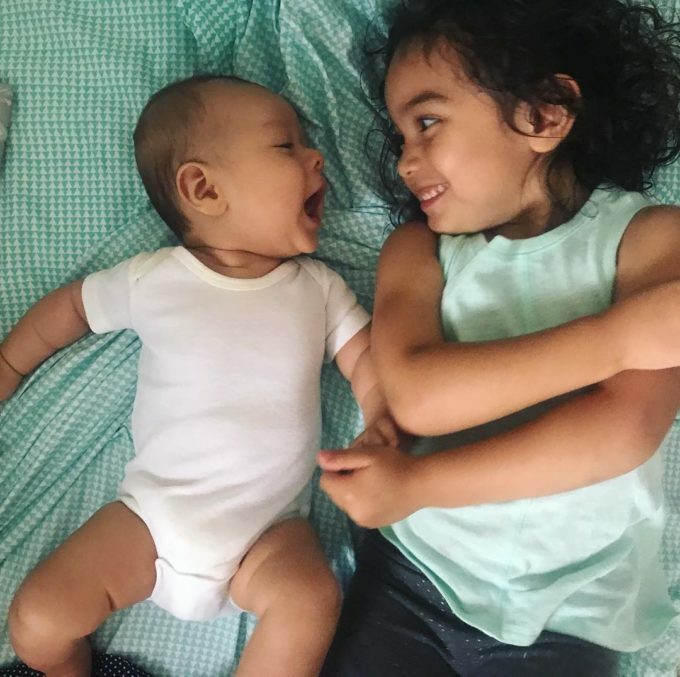 Raising a family no matter how you do it brings challenges, but I think multi-cultural families have often have more things to navigate. This whole piece is a DREAM. Several other people have commented – and I agree – that it would be so good to have a post on what it’s like to raise children far away from your own parents/family. Motherhood Around the World touches on this, naturally, but I think it’d be really insightful and interesting to hear from parents specifically on how they deal with distant families: what coping mechanisms are there, how do you ensure grandparents and kids are close, what do you do when money’s short, or people are too ill to travel, can you substitute family, do you have any regrets, etc. It seems like a lot of this are (or could soon be) in this situation, and it’d be fascinating to hear some stories and advice! I would really love to see something like this. Although I do not currently have children, it is very likely that my children will be born and raised over 3,000 miles away from our immediate family. Oh yes! I agree these are great questions and such a relevant topic as I think so many families are raising kids away from extended family. All I can say is it’s not easy. However, it does make me appreciate time with extended family even more, maybe because it does happen so rarely. I’m a Chapin living in California, been here around 11 years, also had to adapt to many things that are totally different, I felt people here didn’t care for other when realized nobody greet you in the streets or care about sharing meals on a table. Love it here though, Antigua is beautiful and many Europeans and Americans retired there. Myself and kids also drink coffee since babies, even living in the city. Is cultural. We produced great coffee. Beautiful family. I Love your story. Hi Camelle! So fun to “meet”- we’re kinda living opposite lives :) California and Guatemala are the two places I consider home. I too, live in Antigua and am from the states. Her description of how difficult it is to blend families here resonates deeply with me…beautifully written! Thanks Em. So you live in Antigua currently?!! I am from Guatemala and I really loved your article. Happy to know the way that I growled up is still on. You have a very beautiful family. I was raised as a first generation Mexican American, and I remember being confused growing up about some of the things she listed here! Like how some kids couldn’t have coffee (or even soda) but I’ve been having coffee since before I can remember (I think for me it was more of a typical social norm rather than the reason listed here. Almost all family visits lead to some coffee, but to be honest I don’t know where that originated from). I still feel stuck for words in English that I know in Spanish, or vice versa. Like the other day, I was trying to think of an individual English word that means desvelada (or desvelado), which basically means you feel like you didn’t get enough sleep, or went to sleep late for “desvelé.” I even checked Google translate and they didn’t have my version of the correct translation haha. I loved Michelle’s description of adjusting to a foreign place while still keeping true to her own values. It sounds like her family is getting the best of both worlds! Thank you for sharing your story. My mother is from Guatemala. Ive been a few times. It is a much different life. God Bless you. It is a curious thing, my husband is a foreign here and I think he should read all of these posts, maybe you could do a “Fatherhood around the world”? Anyway, it is true that parenting in my country is not so different than parenting in his, so we don’t feel such a difference. At a first reading I had the feeling that Michelle doesn’t seem to be very comfortable with all those differences, but now I see in her a wonderful example of fully adaptation. Muy bien Michelle! My husband is too – I think this is a great idea! We have funny and sobering stories to share on how to bridge gaps, for him and me. Best wishes. Oh yes, it would be so interesting to hear a perspective from fathets who are raising kids in cultures outside of their home country! My favorite in this series so far! (And I LOVE them all, really). What a lovely family and perspective. This is, by far, my absolute favorite series on your blog! 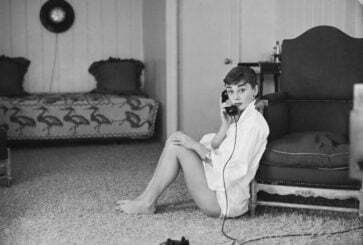 It’s endlessly fascinating, and I have so much admiration for the women you profile. I secretly wish I could be so bold as to pick my family up and move overseas-what an amazing life experience. Thank you for providing a glimpse into these women’s lives! It shows that there is no one way to be happy and that our world has so much beautiful diversity to it! Thanks, Eliza! You’re so sweet. I look forward to these series but I hope you would consider changing the category name from ‘motherhood around the world’ to ‘parenthood around the world’, even if it primarily focuses on mothers. Limiting the language of parenthood to ‘motherhood’ can reinforce hetero-normativity and be hurtful/exclusionary to parents who are trans or LGB-identified. Reflecting on the language we use is a great and simple way to be an ALLY! I was impressed by the thoughtful presentation of poverty: how getting wet is a privilege because many do not have extra clothes, how you might buy a paper clip or a diaper one by one, how theft is prevalent. I thought presenting these details as they weave into the author’s everyday life, as opposed to making a broad statement about poverty, made her description much more real, and relatable, and respectful. And, like many other readers, I appreciated her insights on inner and outer shifts, and her thoughts about when she adopts her new culture and which parts of her native culture she retains. Also, I loved the photos in this post! I read a few of the reader comments about the challenges of raising kids when you are not near your family. I live 3000 miles from my parents and am raising three young kids and it is very difficult in a lot of ways. I’d be interested in a post on this as well, and happy to contribute. Yes to all of this! I thought Michelle’s thoughts on poverty were well expressed, and I’m 3000miles away from family too. You expressed just what I was feeling reading this so well, thank you Amelia! Thanks Amelia. That compliment means a lot. I have learned a lot about my own assumptions and that how I present and talk about people who live in poverty matters a lot. I try to use person first language whenever possible – a “family who lives in poverty” instead of a “poor family” for instance. But I feel like I can’t really talk about the poverty around me without also discussing privilege. I agree!! Michelle wrote about poverty in such a respectful way. You have a lovely family, Michelle, thank you so much for sharing! Es una historia muy muy hermosa me siento feliz y orgullosa de que le aya gustado mi pais Guatemala. Y muchos respeto para Michelle y a su Familia por no ser rasista. Me conmovio mucho esta historia que Dios cuide y bendiga a esta Familia. ¡Que amable! Muchas gracias Mercy. Si es un país maravilloso. Oh, I wish you all the best in your move. I have a few online friends who live in Rwanda. Where are you moving to? This one was stellar – she is clearly an outsider and an insider to Guatemala in so many interesting ways. And the feeling of your kids only knowing one world that still is foreign to you is a really interesting concept as many of us become more mobile and may plant roots for our families in places that may fundamentally differ from what we know best. Thanks Emma. I like how you worded that – an outsider and an insider. I love this series so much, thank you Cup of Jo for running it! Would you consider doing an interview of “surprising things about parenting in the US” and interview a woman (or women) who grew up in a different country and is parenting here? It would be fun to see the perspective people from different cultures would have on the “parenting norms” here in the States. Ooh, I would love to read that! Yes that would be so interesting! I actually *think* COJ did one about parenting in the United Stated last year??!! I love this series, and loved the insight into different cultures marrying. Once again, your blog rocks. This series is amazing, important and so needed! This hit close to home for me in so many ways. I’m married to a foreigner, and the balance of two very different cultures in a marriage was hard to find. We talk a lot about how that balance will work when we have children. Thank you for writing this. It was reassuring to hear someone acknowledge that the cultural balance can be hard. I’ve bookmarked this to refer back to when needed. My husband’s family is also very, very concerned about the cold. I’m forever being forced into slippers and socks when it’s 80 degrees! marriages! There are tons of great resources out there so you don’t feel alone. Gracias por compartir tan hermosa experiencia, por un momento me has hecho transportarme a mi bella Guatemala y sus costumbres aunque parezcan un poco “sillies” pero solo se vive una vez y disfruta tu que tienes la oportunidad de vivir en 2 mundos diferentes. Gracias Mario. Poco a poco estoy adaptándome. Si es un país y una cultura tan bella. such a great series- such a great post! I really do enjoy this blog so much. Stickers as a reward for being ‘not shy’. I cringe. I think it’s clear that she is rewarded for being polite and friendly and participating in their culture that emphasizes exchanging niceties since it might be a behavior that is harder for her because of her shyness. I don’t see that as cringe-worthy. Marna, I too think we should accept “shyness” in others, especially children, as just part of who someone is. I saw the poster’s story more like Jaime though. Rather than “change” her child, I just saw it as an attempt to help her learn politeness in this culture. As a nanny, and mom, I do this over and over…just through practice and repetition help children learn “thank you” “good morning” etc, even when, especially when, the child is reserved. When the child knows they can respond without fear, it’s very empowering for the shyest among them (coming from a very shy person myself). Hi Marna, (and Jaime and Sasha), yes I would cringe too ;) And I would never want to “change” my shy and somewhat reserved daughter, but rather help her have tools to navigate the culture and country where we live. Most or all Guatemalan kids that I have seen, commonly greet adults with a kiss on the cheek or a hug, which I would never make my child do. But in an effort to be polite, in our family we have had to practice saying “hola” and “adios” either with words or wave. Beautiful story, everything she said I true, guatemalans has to say “buenos días” to others even if we don’t know them as a sign of respect, the pepian (Guatemalan dish) is the best, eating “frijoles (black beans) is a must and we eat them for breakfast, lunch and dinner, the most funny part is the “heated smoothie” believe me, guatemalan women’s are very careful when they are pregnant, milk can get cold!!! It might be interesting to flip this series and do what’s interesting about raising your kids in the U.S. if you aren’t from the U.S.
What’s strange about our motherland? Muchas gracias. Y que suerte con tu próximo viaje! Yes! I have a quite a few friends living and raising kids in Southeast Asia and they say the same thing! What a beautiful family. Thank you for sharing. 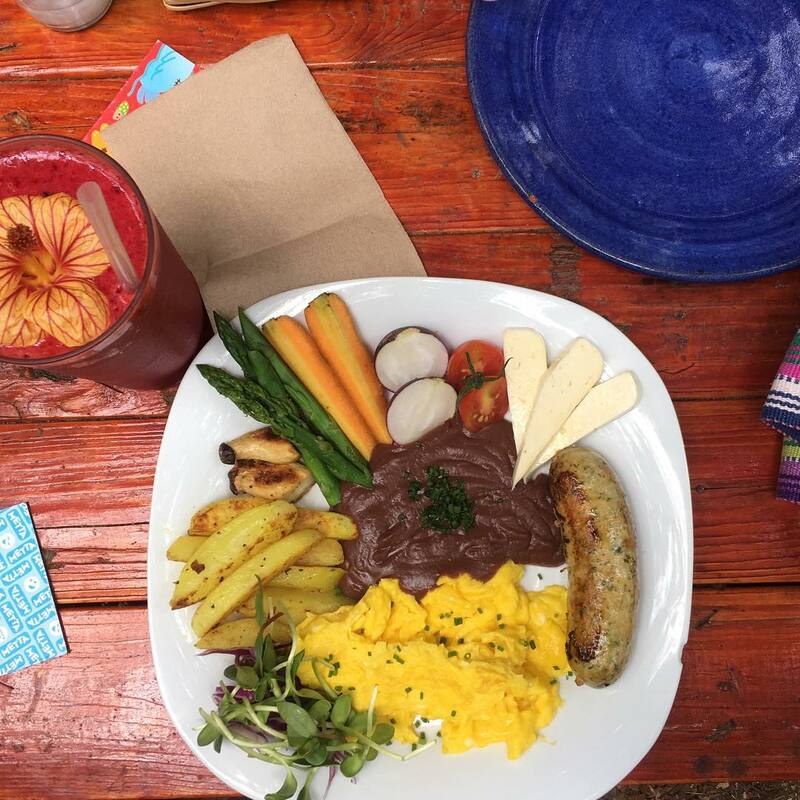 That plate with beans in the middle looks like the most tasty food I have seen in awhile. The bowl also looks delicious. This has been my favorite Mothers post. I lived in Guatemala for almost 3 years and this made me homesick for that beautiful country. People there are truly so warm, and generous and caring. I lived in Totonicapan in a rural area and had very similar experiences. I am impressed by how she said her Husband had to relearn things internally. I had always wondered about that because the gender divides are so big, but it’s wonderful he is willing to bridge them even if it is hard. I can’t wait to go back in visit this fall. Hopefully the rainy season will almost be done! I was just talking to my husband tonight about the best steak I’ve ever had. It was at an Argentinian steak house in Antigua called NiFuNiFa (on my visiting father’s dime, of course). And the pepian. Yes! And the fresh fruit in the carts near the parque central… Now you’re making me hungry! So many memories are flooding back. Thanks for the trip back in time. Lovely post! Aww yes! You know Antigua well. My husband loves the steak at Nifunifa! Also, I traveled to Guatemala two years ago and it was so wonderful and beautiful. In addition, the black beans there are the best I’ve ever had! I’d eat it for breakfast, lunch, and dinner! (The coffee was wonderful too). So beautiful! 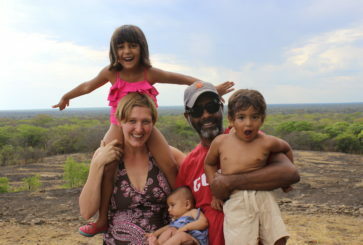 My husband is Panamanian and we spent our first 5 years together in Panama, also where my daughter was born. My daughter and I moved back to the States when she was 6 months old and my husband followed a year later. I am amazed at how similar the Guatemalan culture and Panamanian culture are! 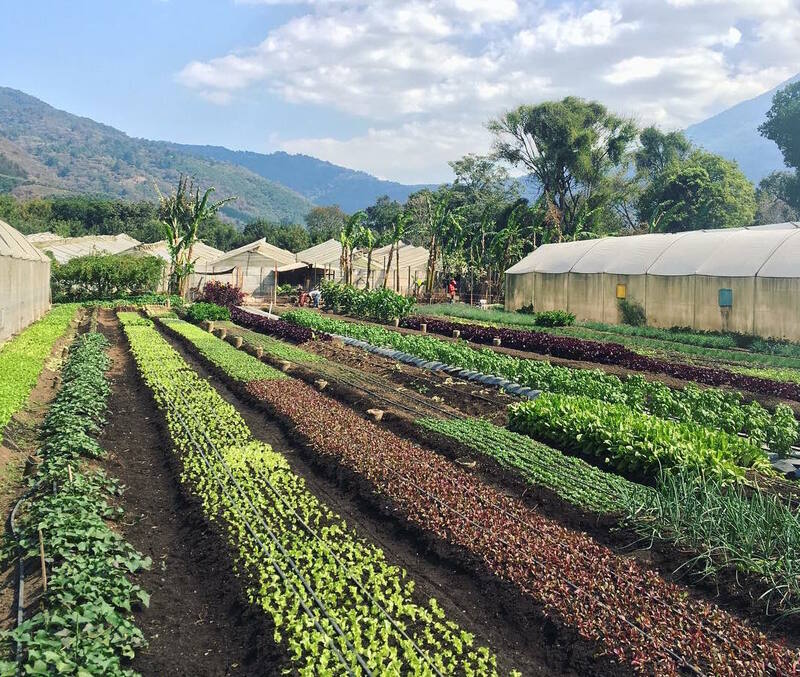 I definitely hope to visit Guatemala someday and I will look Melissa up to see if we can plan a meet up (and to learn more about her and her husband’s wonderful business!). Thank you for sharing a little about your life with us! Yes, I do think there are probably many similarities between Panamanian and Guatemalan culture! A beautiful story about respect, love and equality in a world that at first glance lacks all three. I am Guatemalan and I couldn’t express the genuine sentiment the writer portrayed throughout. Thanks Oswaldo! Your words are so kind. Tienes un paiz muy lindo!! Urgh this totally made me cry. What a beautiful interview, thank you so much for sharing. What a beautiful, thoughtful perspective on immersing yourself into a different culture. The Motherhood Around the World series is the best thing on CoJ! Please try to refrain from the affiliate links in these wonderful personal pieces. Not only is it offensive to the author, but did you think of the irony of posting a link to the “baby straight jacket” that Michelle is clearly not suggesting to be a good purchase. Whoa, there could have been a kinder way to express your feedback Bobbib. I assumed (as I expect did the majority of the readers) that the link was just there to clarify what exactly the product is, to those of us who are unfamiliar. You don’t have to click it! I am German and did not know what this kind of jacket meant. So for me the link was helpful, I did not consider it as advertisement. Well, I think Cup of Jo in general is very careful and considered when it comes to affiliated links or even posts. In this case I was super thankful for the link because I had no idea what exactly she was talking about and a visiual helped. Additionally we can assume that everyone coming to this blog is intelligent enough to (dis)connect text and link. Myself, a childless lady, appreciated the link so I knew what she was referencing. Think of it as framing an idea, not suggesting you *buy* something. I didn’t see it as an affiliate link, but a link to show what a swaddle blanket looks like. I used a regular blanket to swaddle, so I didn’t know what a dedicated swaddle blanket looked like. There was a link to the birthing center, also. Love this one so much. I read these every week; one of the best things on the Internet, but I think this one is one of my favourites. Michelle seems like the kind of person any young girl would be lucky to have as a mum or mentor! Aw, Alexia. This is such a lovely compliment. Thank you. Thank you for the wonderful read. How very insightful! You don’t need to post my comment but where is the hostility as there was to the family from Israel! It’s so tiring to read the latest in “progressive” thinking. And why is that everyone thinks they are an expert on Israel? Why not Jordan, Egypt, South Africa, etc…..I’m and American married to an Israeli, and I can reassure you that I am no expert on the subject, in the least. Just sick of the hypocrisy. I don’t think it was hostility–as much as an acknowledgement of the nuance that HAS to be discussed when talking about Israel. No one is saying they are an expert on Israel–I think what people are responding so warmly to in this instance is that this mom seems to reckoning daily with privilege, assumptions, and so on. Something we all should do–particularly when feeling righteous indignation so strong (based on a blog post) as you feel–about this one and the last one in the series. Progressive thinking doesn’t require speech marks. And opinions are permitted, either way. When the feature on British parenting was posted, it most certainly did not represent my (British) experience of being a mother in this country but was none the less true for that particular mother. I look forward to reading many more of these posts from contentious parts of the world as well as those more peaceful. Let’s not forget what this is all about: how to be a parent when you are out of your home environment. This post is just wonderful! I especially appreciated how Michelle stayed so fluid in her learning. I feel this fluidity applies to experiencing and embracing not only a new culture, but also parenthood in general. Thanks for featuring such a delightful family! Yeah I agree. Living oversees had forced me to keep learning as a parent and as a person. Good luck with your move. There was a mom living in Mexico featured last year on the Motherhood Around the World Series I think? I loved this installment of the series for so many of the same reasons other commenters have! One question I always wonder when I read these posts is how does living and raising children abroad affect these women’s relationships with their own families back in the U.S.? My parents and I have always been close, but after my son was born I feel like I relied on them and appreciated their proximity even more. Although it sounds like many of these mothers have kind and helpful in-laws and extended families, sometimes there’s nothing like having your own parents to lean on. I know every person and his/her relationships are unique, but I’d love to hear more about this topic in a future post. I’d also be interested to hear about parenting far away from your families from those of you who live across the country from your hometown. I’m raising my children here in America as an expat (posted here for my job) and both sets of grandparents are in Asia. It’s hard! I think with facetime, the physical distance feels less as the kids get to factime with the grandparents often and we have a family Whatsapp group that we send pics/videos on daily. That being said raising children with no family around is very tough. If our nanny calls in sick, or on those days where you simply need some support and have no one call is really tough and lonely. I’ve developed severe anxiety that I’m seeing a therapist for and I constantly feel overwhelmed. It’s also so lonely seeing everyone celebrate American holidays with their families, and almost worse to have no one to celebrate your own holidays with. Being an expat married to a local would make it far easier I imagine. It is very interesting what you wrote. We feel so many of the same things! I’m an American that grew up abroad but now live in Chicago with all of my family on the East Coast. Though I am not estranged from my family, they do not visit and I am totally on my own, besides my husband. He travels frequently and I constantly feel overwhelmed and inadequate trying to be the best mother to two little ones. It is hard and very lonely; I wish I had a close relationship with my parents, but I have to accept it and move on. It has taken me years to develop good friendships here and I, too, feel sad when I see everyone with extended family around. Though I also suffer from anxiety, I try to be bold and put myself out there to make friends that I can rely on since my family is far and unwilling to help. I am an American who spends most of my time living abroad for work and have thus encountered a whole lot of American expats. I know some people for whom it is really hard, and some who have left expat life because they couldn’t handle long-term separation from family. Others find ways to get home a lot or have family come visit frequently (or even live with them all or part of the year). But I think there is a third subset that can manage that way of life because they aren’t as close to their families. I personally fall into that category, and I have definitely seen it among others as well. I don’t have a close relationship with my parents – when I was growing up, they were very hard on me, and while we’re not estranged, I now feel little need to spend lots of time with them. My husband and I have a very close marriage, and we do feel like we create home together wherever we go – and feel that, once we have kids, we’ll probably be a closer nuclear family unit than we would be if we just stayed in the States, and that will be a fair trade-off for less time with extended family. I’d love to see a post on this too Katie! I’m an expat raising my daughters in Australia, and it is so so hard not having my family close by. You’re right that sometimes there’s nothing like your own family, and when they’re 5000 miles away it can make for some pretty hard/lonely times. “Is this working for you?” I love that. What a great question. I smiled the entire time I read this. I love the part on greetings, just to say “I see you”, how lovely is that? What a sweet family and well put together post and beautiful photographs. I adore this series soooo much. you truly have the greatest blog. thank you for keeping this series alive. every single one has been eyeopening and world-shrinking. Loved this. First of all, Michelle you are GORGEOUS. Secondly, the discussion of pushing back against some of the cultural and gender norms that don’t jive with you in a respectful, gentle, yet intential way was really wonderful, and what I love most about MATW. I love, love, love reading this series every single time. I learn so much, and yet feel so similar to women (and people) around the world. Michelle is particularly eloquent in her observations and understanding, great reminders for us all. Thanks Anne! That is so kind. I love this ” simply asking, ‘Is this working for you?’” Something we all can adopt! Hmm… I’ve read it a few times and I’m still not entirely sure what Michelle believes went wrong during the coffee situation. Can someone please explain it for me? I think its the fact that in america children dont drink coffee, its an “adult” drink. Its the same way here in Ecuador, where I live. The first coffee i had was probably when i was 15-16 years old. I was confused by that too, maybe for a different reason- I completely appreciate the general principle of not imposing cultural norms, but if the issue was that the water needed to be boiled, what does that have to do with turning the water into coffee? I’m not trying to be an insensitive jerk; I’m genuinely confused! Yes, great question!! Where I few up in the USA it was not common for kids to drink coffee. It was always viewed as an “adult beverage” but I know in many parts of the world (Guatemala being one them) coffee is something shared by the whole family. Pepian sounds delicious! I’d love to know how to make it authentically. You can find a few recipes online, but of course I think it’s best here in Guatemala! This is one of my favorite MATW posts so far. Michelle expressed her feelings so eloquently and with such a deep respect for the Guatemalan culture. I was a Peace Corps volunteer in Nicaragua, and although it’s a different country, of course, they seem to share many cultural similarities with Guatemala (I still miss all the greetings in the street!). This was a fun, nostalgic read for me (and for my husband- we met in Nicaragua as PC volunteers) that left me longing to re-visit that beautiful, inviting part of the world, this time with our toddler in tow! Oh thank you. I had quite a few Peace Corps volunteers friends here. And we’ve road tripped down to Nicaragua a few times. It’s not a quick drive but such a gorgeous country. San Juan del Sur is one of our favorites spots!! Ditto! I am also a returned peace corps volunteer. Met my husband during our service too! We served In Guatemala. It’s an amazing country. We go back every other year. I was so excited to see Guatemala featured. I loved reading all about Michelle’s assimilation. My favorite part was all the rain names. I use them all the time still! Love this series. Love love love this post. Think it may we’ll be my favourite so far. This is very thoughtful and sensitive. Thank you. Yes, so so true. I think that is true for a lot of foreign/expat parents raising kids in country different from the one you call home. This is one of my favorites in the series! Thanks for sharing. May we all (white, cis women) cross-stitch this on pillows or tee shirts and apply it to everything, every day. Yeah, let’s all cross-stitch away. :) I still need this reminder daily! My favorite line in this essay too. So great to see her openness and humility when learning about her new culture! Accepting that others do things differently for different reasons with no judgement is not easy, but if everyone did this the world would be a better place! My eldest son’s godmother (well, godless godmother) is Guatemalan, and the sunshine she brings into every room she’s in is unbelievable. Her culture radiates out of her and it’s a place I’ve always wanted to go. She has a natural knack with children and from the stories of her childhood, I think growing up in Guatemala had a lot to do with that. This piece makes me want to visit even more! Oh and the concern over cold is a thing in parts of Asia too, absolutely nothing cold or iced for pregnant or nursing women. So frustrating when you crave nothing but cold green apples and ice cubes for three months! Yes! I have friends in Asia who have said the same thing- I read somewhere that it has some roots in Chinese medicine. Who knows, maybe it does help? It’s just so far fetched from anything I grew up seeing or experiencing, you know? Loved this one! So many thought provoking perspectives! 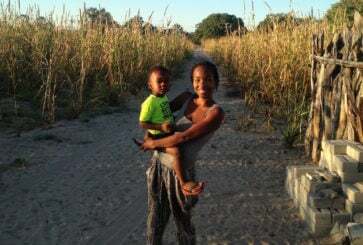 I’ve visited Antigua doing service projects and sightseeing and loved it! Guatemala is such a beautiful country (one of the most gorgeous plane landings I’ve ever experienced-breathtaking!). The culture is so warm and welcoming. I love how Michelle and her husband have both adapted to create such a beautiful life and family. Thanks Abby. Yeah I know what you mean, the plane landing with volcanic views IS pretty spectacular! I LOVE this series so much! 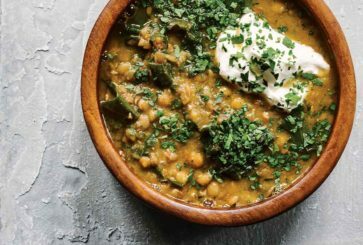 I especially loved the pictures of the food and her basic recipe for black beans – I wish every post would have a short recipe from that area that we could try. So interesting! Thank you CoJ team for your hard work on this and Michelle for participating. Yes! I immediately looked for pepian recipes after seeing that photo. Yeah I think a lot of cultures have very strong feelings on temperature and being cold?! This was one of my favorite Motherhood Around the World posts. I am going to Guatemala in October and am definitely planning a day trip to Antigua. It looks beautiful! Oh yes, if you’re coming to Guatemala you must come to Antigua! Equal parts culturally respectful and personally invested. I loved reading it! yes! loved this bit. as a global nomad who has lived in 10+ countries, I wish we all did a better job of listening and learning, rather than judging or assuming. Thanks. It’s something I strive to do and have to keep practing! Love this so, so, so much! Especially: “I learned to observe and understand the complexity of a situation before assuming that my cultural knowledge is best.” Words to live by! And also, I love Guatemala! What a thoughtful, eloquent and moving glimpse of a family’s life. I especially loved the statement, “I learned to observe and understand the complexity of a situation before assuming that my cultural knowledge is best”. I also appreciate Michelle’s efforts to respectfully define what her family does differently than the traditional culture without criticizing or aiming to change it. As someone who works in international education development I appreciate and share these beliefs and practices. Thanks for sharing Michelle and for the terrific interviewing Megan! Yes, Megan gets most of the credit. She took my words and experiences and made them into something clear and concise. So funny to read the part about babies getting cold in relation to some of the other Motherhood posts, especially those families in Scandinavian countries! I know! I thought about this– my Guatemalan family would be shocked to know that in some places babies nap outside- in the SNOW! I really loved this. What a thoughtful, intelligent person Michelle seems to be, and how respectful and loving she sounds when talking about her adopted country. I wish we were friends. Well, thank you! That is so kind of you to say. I love this! And recognize a bit from my own (very short) time in Guatemala. Your approach to understanding another culture and expecting that there is a lot of value there for you to learn is very inspiring, and I loved what you have to say about your and your husband’s inner/outer worlds. Antigua was flat out the most beautiful place I’ve ever been. Thank you for such a wonderful glimpse into your world! I love this one. What a beautiful family! I’m from California, and I have loved Guatemala ever since visiting there as a child, so it was fascinating to read some of Michelle’s observations. Love the descriptions of family roles, bean sandwiches, coloring inside the lines (fascinating in such a richly creative/artistic culture! ), and buying one paperclip at a time. Great details! Mmmmm I loved “It’s a way to be polite and say ‘I see you.’” So lovely that this culture makes such a concerted effort to acknowledge people and recognize their value – even with simple greetings. Beautiful. Great read! 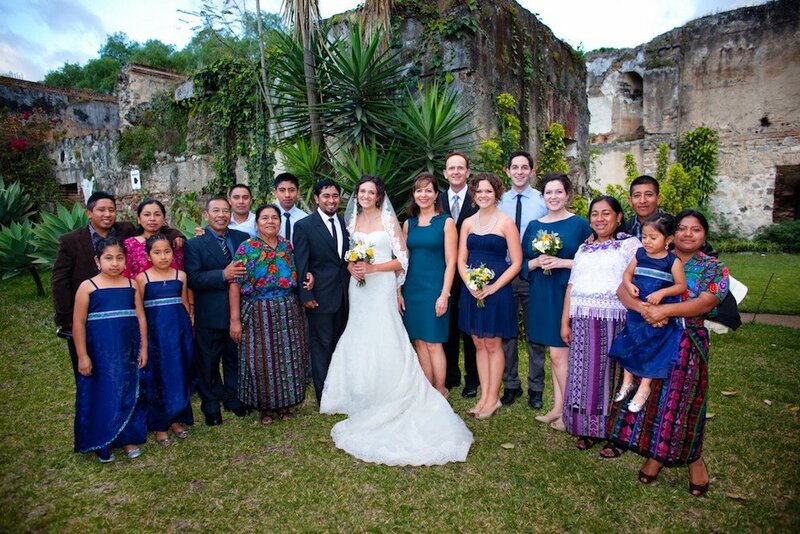 I visited Guatemala a few years ago with my now husband, and we often talk about going back. Antigua is SO beautiful, and so is the entire country! This may be my favorite of the series. 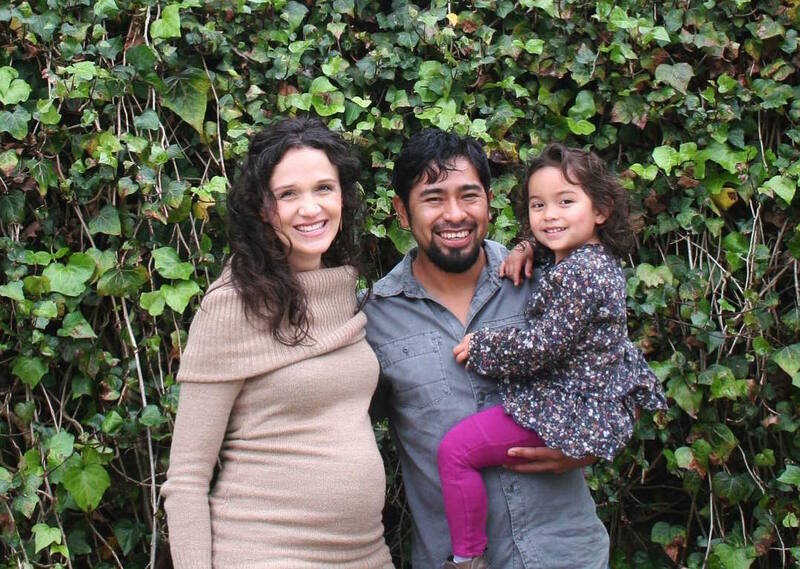 Our part-time nanny for our almost 2 year old is from Guatemala. She is the most loving, caring, and positive woman I’ve ever known and we are so grateful to have her to help us raise our kids. She is super respectful of our preferences, but the one thing that made me laugh was that until 2 or 3 months ago, she NEVER let my kid be bare-foot. She asked me to get house slippers and non-slip socks for her so that her feet wouldn’t get cold… I always thought it was a personal thing, but now I see keeping the baby’s feet warm is a Guatemalan thing! I have read many of these posts about Motherhood Around the World, and I usually enjoy them very much, but this one may be my favorite. It seems to be the most sensitive and expressive about what it’s like to navigate cultural differences in a way that is respectful, adaptable, but still considers one’s own values and practices. It was so interesting to read the way you and your family have taken on this complicated and beautiful work, Michelle. Thanks for sharing. Wishing you all the best! Was about to make a similar comment. My favorite Motherhood Around the World post by far. You can tell Michelle is a wonderful mom. Exactly. You perfectly expressed what I liked about this post. Michelle seems like such a lovely, enlightened person. Great interview. This is exactly what I came here to say. 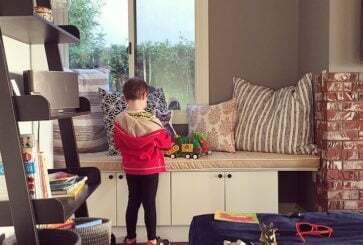 This has been my favorite Motherhood post for sure and it is absolutely because of her patience and acceptance of the unfamiliar. Her generous sensitivity to her family and Guatemalan culture is respectful, curious, and compassionate; we could all do well to be as considerate and conscientious as this beautiful woman. 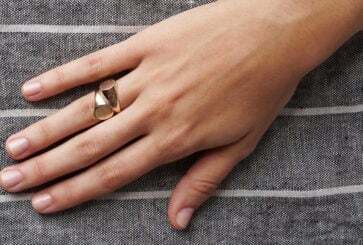 Cheers to you, Michelle, and the CoJ team for the feature! Naima, I came to comment a similar sentiment, but you summed it all up! I loved this. I love how everyone in this series has the coolest jobs. So inspiring! I thought the exact same thing! Funny how the way you string together words can give such a big impression. And Mexico! Well, at least in my family. I wonder if it’s also associated with other hispanic/latin countries. I love the humility and cultural acceptance she’s demonstrating throughout the article, and not assuming, as a foreigner from the most “successful” nation (arguable, but still accepted widely) in the world, to just know better than the locals. Also, good observation about co-sleeping. It’s only a “thing” for those of us for whom having a room for each member of the family is the norm! I am so struck by how much she’s said she’s had to learn since being in Guatemala. If only we could all be so sensitive and flexible! What a beautiful family. I loved the part about changing your inner vs. outer world. It makes so much sense :) my boyfriend moved from Tennesee to Europe and lived in different countires, now we both live in Belgium and I see how he sometimes struggles with our funny Belgian culture. I often try to explain that it is hard on me too, and this sums it up. So happy I can explain this in a different way now. Thank you! Yes, the inner and outer world is a very good way to explain it. Also for me as an American living with my Dutch husband in the Netherlands. Groetjes uit Amsterdam! Oh my, this one hit me hard! As someone who grew up in Guatemala but hasn’t been back in 11 years, I cried reading this and looking at the pictures. Little details like the coffee thing, certain expressions she described, and the pictures of the huipil (the traditional blouse) are making me nostalgic but full of love. Thank you for this. Love this series!!! I teared up when she talked about her daughter humming the national anthem with her hand on her heart. How sweet and proud. Thank you!!!! What a special, treasured culture. I’ve heard similar stories from friends who have grown up in or visited Guatemala. And I’m so fond of their greeting custom…a far cry from the streets and workplaces of the States where it’s most common to observe people looking down at their phone. I really enjoy this series! To normalize different lifestyles with such respect is heartwarming. Love it. 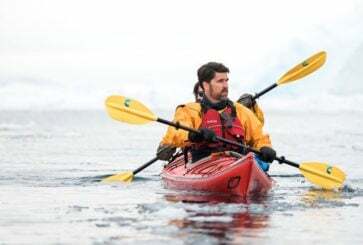 I really loved this quote: “After that night, I learned to observe and understand the complexity of a situation before assuming that my cultural knowledge is best.” A beautifully, self-aware observation from which we can all learn. This may be my favorite post in your Parenting series. I love how honest Michelle is with describing how she’s fitting in and adapting to Guatemala. The pictures are so colorful and beautiful. It makes me want to visit. Michelle, thank you so much for sharing this. I love this series so much, and this one was super interesting, especially all the honest details about her adjusting to different customs and her husband adjusting to different family structure. So great! “I learned to observe and understand the complexity of a situation before assuming that my cultural knowledge is best.” YES OH YES. Thank you for your wonderful perspective and for your honesty about living in the tension between cultures, especially as it relates to your marriage! I love how you and your husband speak about parenting and home duties. Inspiring! I was about to make the same comment! Love. What a thoughtful and respectful approach to being an expat. Thank you for sharing, Michelle! I love this installment of this series – it is perhaps my favorite! Thank you for sharing, Michelle! It makes me so happy to see a happy family living safely and comfortably in Guatemala. I have had several immigrant & refugee students over the years from Guatemala and I wish they could have had the chance to live so peacefully in their home country. I am struck by Michelle’s humility and how she acknowledges how much she has had to learn in a new place. Thank you so much for this beautiful series, CoJ team! Thank you for sharing, Michelle. You have a beautiful family! I love learning from other women who are so candid and honest about their daily experiences as mother’s and wives. We’re all in this together and I appreciate your perspective! Wonderful. I can’t imagine a relationship where this practice wouldn’t be a good addition. Ohmygosh! Chills. I especially liked the discussion of changing their “inner” vs. “outer” worlds and what a process it has been for them both. Beautiful photos, beautiful family, beautiful culture! Thank you for sharing with us.